Stockreversalspremium.com a Swing Trade and Forecast Advisory service. 75% success rate on trades since September 2013 inception. TippingPointStocks.com a Long Term growth stock advisory service aiming for 50-200% gains per position! Just launched October 4th 2017! 212%, 160%, and 102% Gainers already! Read up! Obviously more highs for the indexes this past week, but we do have the Government Shutdown over the weekend which could cause some short term upheaval. 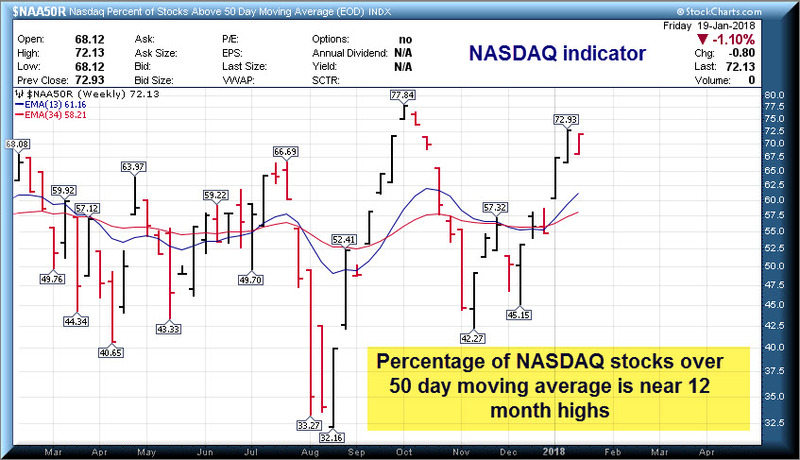 The last time we had one we had a 4.4% drop in the NASDAQ over a few weeks followed by a 5% recovery rally. 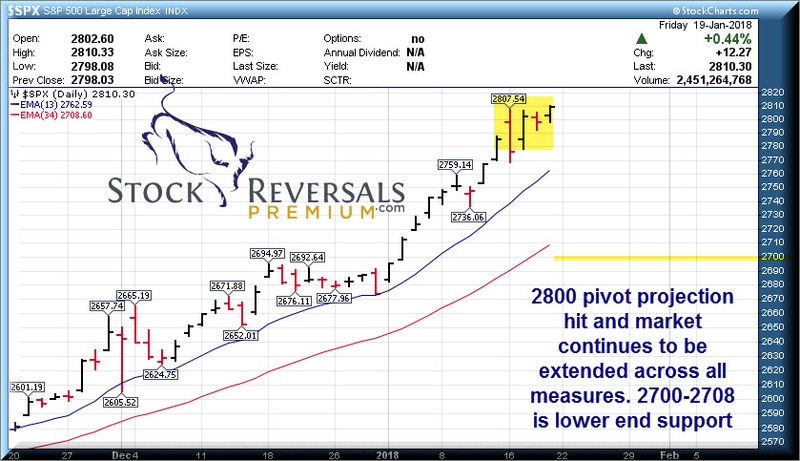 At any rate, over 2800 which was really our final line in the sand “extension” pivot projection for the SP 500 we have lost track of this market in terms of wave patterns. 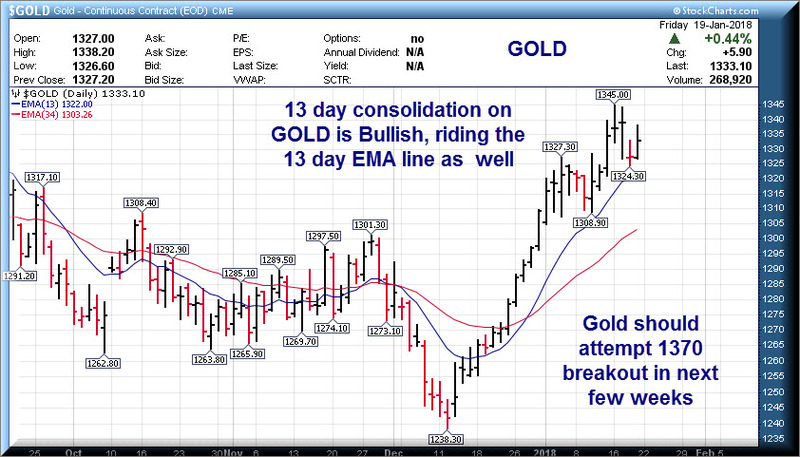 What we have been doing at SRP is focusing on the 13 day EMA line on the daily charts, and riding the trend. Until that breaks the uptrend is intact. On the lower end is around 2700-2708 areas for lower support and still keep the overall uptrend intact. If not yet a Free Member of Stockreversals.com , opt in here with name and email to get timely reports and trade ideas every week and sample our work! 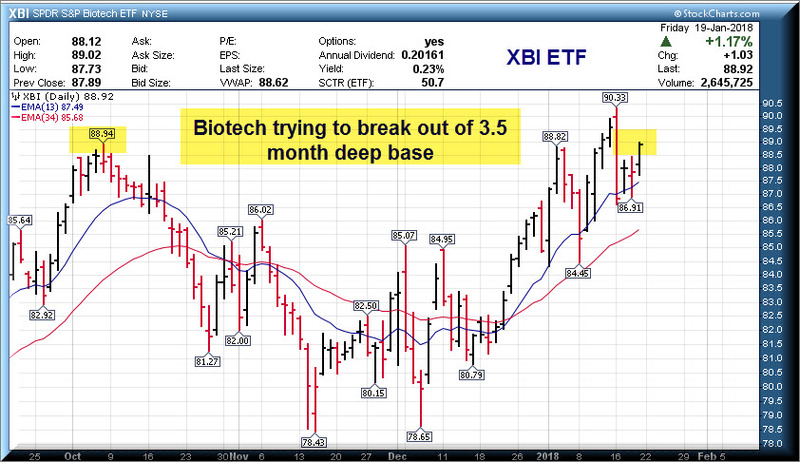 This weekend some charts on SP 500, XBI ETF (Biotech), Oil, Gold, and a NASDAQ indicator which is getting peaky. NASDAQ Indicator- This is nearing overbought levels if not already at 72%, the 2017 high was 78%. Have you looked into our TippingPointStocks.com Growth Stock Service? 212%, 104%, and 160% Gainers already!! Read up and consider joining! We go for maximum gains with limited downside risk over a 6-18 month holding period expected. Proprietary Research with stunning results, read up ! Bulls in Advisory Surveys are at 66% vs only 13 Bears. This is the highest reading ever, and concommitant with super stretched SP 500 and index levels. This is a contrarian top reading here, so just be aware. Significant numbers of stocks are at 52 week highs or close, also overbought indiator but we are riding the trend. Keep eyes on 13 day and 34 day EMA lines on the daily charts for SP 500 for key supports to uptrend. 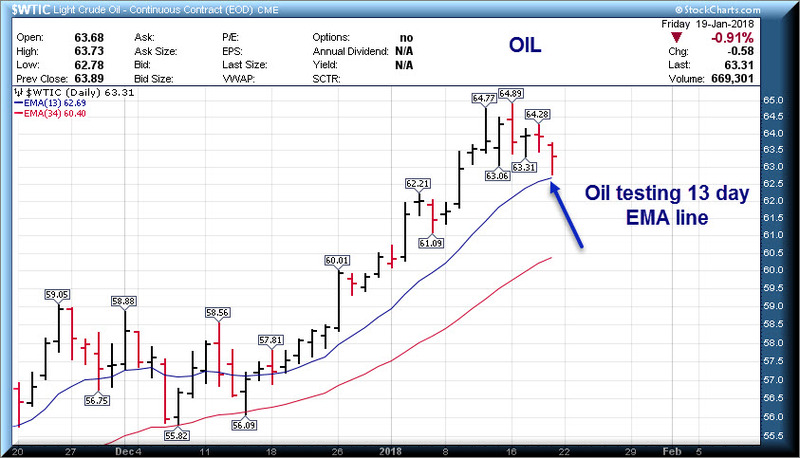 14 Swing Trade Ideas: Each week we try to lay out 8-15 or so swing trade candidates. Nearly every week many of them move up sharply, we try to add some new fresh ideas as well each weekend. Here is this weeks list, some of which we may use as Alerts at SRP depending on market conditions and further work we do. SGH- 15 week base, Designer of Electronic subsystems to OEM’s and PC makers etc.